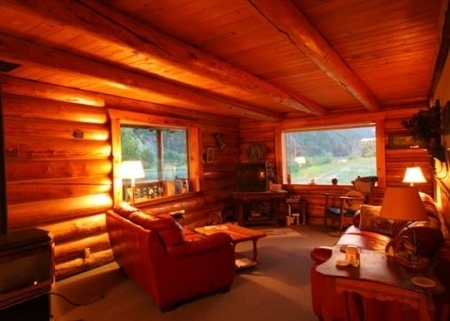 Our first rental unit, the log home called the Osprey House was built in 1991. It has a total living area of 1500 square feet with an additional large porch overlooking the river. It log shell was built out of locally grown lodge pole pine by a local log smith. There is a big master bedroom with two double beds upstairs with a private balcony and a dormer overlooking the "home pool". Downstairs is a full sized kitchen, dining area, a living room, and a separate bedroom with two single beds. A fully equipped kitchen with a microwave, dishwasher, and a gas barbeque grill are available for your use. It will accommodate from 4-7 persons depending on single/couple arrangements. It has a total of 4 beds with hide-a-bed couch. The guest house has a TV/VCR, stereo and a phone.